ABUJA— Head of legal team representing the Indigenous People of Biafra, IPOB, Ifeanyi Ejiofor, has petitioned the European Union Representative over the critical state of health and continued detention of Benjamin Madubugwu who is among the defendants facing trial along with the IPOB leader, Nnamdi Kanu and three others at an Abuja High Court. Ejiofor in the petition, protested that Madubugwu who was arrested since October 28, 2015 from his hometown in Ihiala Local Government Area of Anambra State by operatives of State Security Services, SSS, on charges bordering on conspiracy to commit treason and unlawful possession of firearm, has been detained unjustly without any evidence or witness to prove his culpability in the registered offences. 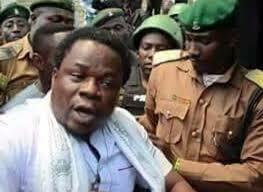 He further stated that despite the court ruling on 17th October, 2017, by the presiding judge, Binta Nyako that his client be allowed access to a medical practitioner, it took the prison authority two weeks before they could comply with the order. Part of the petition reads, “That our client was arrested on 28th day of October, 2015 from his home town in Ubuisiuzor in Ihiala Local Government Area of Anambra State by the Operatives of the State Security Services in a Gestapo style operation and moved to Abuja, Nigeria Federal Capital Territory and consequently charged to court on a two count charge of conspiracy to commit treason and unlawful possession of fire Arm, charge for which the Federal Government of Nigeria has not called a single witness to prove since the date of arrest of our client till today. It further stated that the consultant Doctor further recommended an evaluation outside the prison with “colonoscopy/barium enema to ascertain the etiology of bleeding and subsequently have a definitive treatment. “Despite this seemingly life threatening medical condition and the fact the we have filed a motion for our client’s bail to which we attached an affidavit of urgency as well as the medical report and a letter requesting for an urgent date to hear our application, the Federal Government and its team of lawyers chosed to attend conferences and seminars at the expense of the life of our client and the justice of the case. “We have be labored your good self with the above details to equip you well enough to intervene on behalf of our client by all diplomatic means and to impress it on the Federal Government of Nigeria that only the living can stand trial as our courts have always held. “We strongly believe that our client is allowed to die gradually because of the fact that he is an Igbo man and for daring to seek self determination in line with the constitution of Nigeria and the African Charter on Human and Peoples Rights. “Your Excellency, it is important to note that while the Federal Government uses its influence, powers and authority to deny our client access to good medical attention, the individuals who constitutes the Federal Government visits your countries and enjoy your medical facilities. This is most unjust and we are convinced that your Government and people will frown at such attitude. “The suit against our client has been adjourn consequently on two occasion due to the absence of the lawyers from the office of the Attorney General of the Federation thereby frustrating the hearing of our application on the need to release our client to attend to his health especially where our prison facilities could not handle his condition. Also sent with copies of the petition includes Mr. Edward Kalo, the Resident Representative, Unite Nationals Nigeria, The Chairman of ECOWAS, The Russian Ambassador, Canadian High Commissioner, United States Ambassador and British High Commissioner.